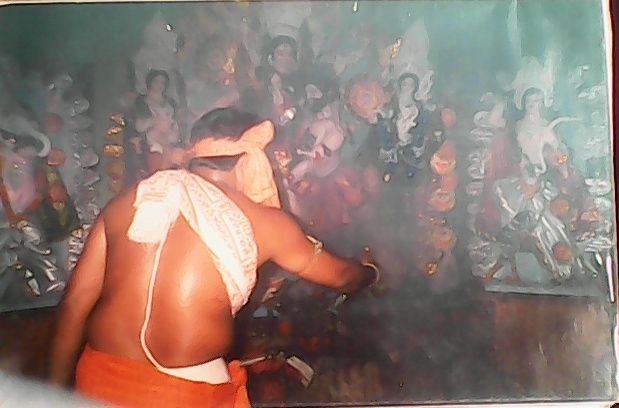 It’s been long eight years I have not visited my village during Durga Puja, in last eight years hardly three-four times I have gone there only for some necessary works though I don’t miss the days now-a-days because everything has changed a lot. 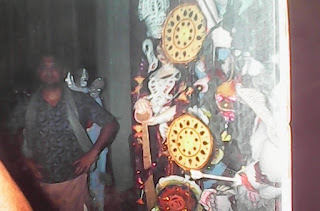 Let me share some interesting things about Durga Puja in my village…. The ritual of Bisarjan is very interesting….the idols of Maa Durga and other god and goddesses are tied with the bamboos and the people of the village takes the idols in their shoulders and walking in bare foot they carries the idols to the pond that is almost one kilometer from the temple. It was the year 2005 I decided to take part in the Bisarjan, those days me with my family members used to visit our village during Durga Puja, I never took any part in the arrangements of Durga Puja and it’s a big irony coz my father conducted the same Durga Puja as a secretary for long 19 years, then my paternal uncles took the responsibilities even my maternal uncles also.So that year I thought let me take part in Bisarjan. So I got ready with a Bermuda and shirt with a Gamchha in my shoulder. When my father came to know about this he became too much worried. The truth is…that year I consumed ten full glasses of that drink and then given my shoulders with others and took the idol to the pond. Some people were very surprised seeing me normal after taking so much of that drink…..i did not answer them, just smiled in reply. Actually they did not know…. sharab me utna dum kahan jo hum jaise diljalo ko hila de. 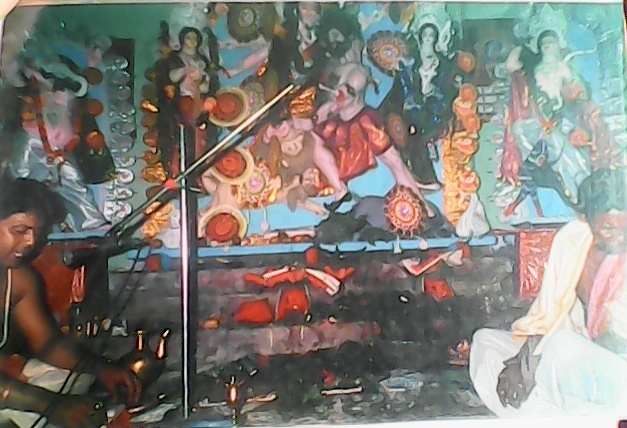 After the Bisarjan the most interesting ritual that happens is…. It need almost 2 hours to complete the ritual…nearly at 12-12:30am the visiting stops and then it’s time to spend time with family members. That year we all went to bed nearly at 2 am after spending some beautiful moments with the relatives and the family members. The original pic has been taken in Kodak KB10.